Adam never imagined that playing a hockey game as an undergrad at Clemson University would determine the course of his career, but that’s exactly what happened. Since there was no ice rink in Myrtle Beach, SC, he grew up playing roller hockey. At Clemson, he joined the club roller hockey team during the school year and tried to fit in as many practice hours during the summer as he could, even driving the forty-five minutes to Greenville for pick-up games whenever possible. It was at one of these pick-up games that he met Andy Kurtz, founder and CEO of Kopis. Between games, the talk turned to business, and Adam shared a story about a frustrating problem he had to solve for one of his classes. A few weeks later, Andy invited Adam to meet the Kopis team, and the rest is history. 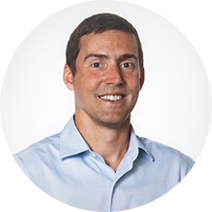 Adam began working for Kopis as a custom application developer in 2005, while still pursuing his M.S. in Computer Science. After he had been with the company for a couple of years, Kopis had the opportunity to do some work with Microsoft SharePoint, which soon grew into a full practice. Adam transitioned into management part-time to help with the growing workload, which quickly became a full-time management position as he took over the Application Group practice as well. Recently, Adam has transitioned again, becoming the Chief Marketing Officer for Kopis. During a strategy session that the leadership team conducted to mature Kopis’ business processes, Adam, together with his co-worker Kevin Wentzel, approached Andy with an idea for reorganization. The company had significant managerial overlap in operations but a void in sales and marketing. They decided to restructure, putting one manager over all operations and one over the sales and marketing division. In addition to taking on additional responsibilities with Kopis, Adam maintains an active sports schedule and enjoys volleyball, cycling, and mountain climbing. He also loves spending time at home with his wife, Jen, who manages software projects for Erwin Penland. ERP: Is it Dying or Thriving in 2019? Technology’s transformative impact on the last two generations is undeniable….